With Shailene Woodley, Ansel Elgort, Theo James, Kate Winslet, Naomi Watts. Written by Brian Duffield and Akiva Goldsman and Mark Bomback. Directed by Robert Schwentke. Rated PG-13 for intense violence and action throughout, some sensuality, thematic elements and brief language. 119 minutes. 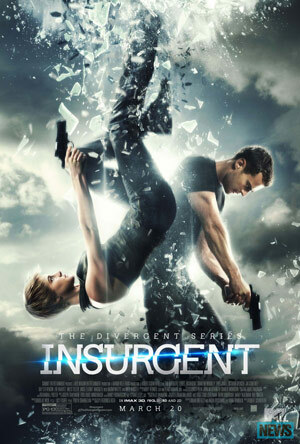 INSURGENT is the second film in the adaptation of the “Divergent” trilogy of books. One of the best thing about the first one was the announcement that it would only be three films. But then the greedy, selfish folks–called the “Erudites” here–saw the box office returns and announced that the third book would be split in two. They really have no shame. Meanwhile, we’re back with Tris (Shailene Woodley) who thwarted a plot by the cruel Erudite leader Jeanine in the last film, but saw most of her faction–“Abnegation”–slaughtered by the “Dauntless” faction, who were being controlled by Jeanine. Now Tris and a few of her allies, including the dreamy Four (Theo James) and her brother Caleb (Ansel Elgort), are hiding among the fourth of the five factions, “Amity.” Imagine a hippie commune and you get the idea. Jeanine, however, has recovered a box than can only be opened by a strong Divergent–someone who doesn’t fit into any one faction–and sends her storm troopers out to capture them for ruthless testing. Guess who that happens to be? To say more would be to give up some of the genuine twists in the plot, so let’s just point out the obvious: but for the success of “The Hunger Games” (books and movies) this probably never would have been made. It’s yet another dystopia in a post-apocalyptic world where a ruthless leader suppresses the majority of the people for the benefit of the few. Any similarity to the real world, and particularly to adolescent feelings of powerlessness, are purely intentional. Shaileen Woodley has not yet had the opportunities that Jennifer Lawrence has had, so it’s not fair to compare them. Woodley does solid work here as she’s done elsewhere, and continues to be someone to watch, even if this series–financially successful as it is–will remain in the shadow of the other films. She is a modern female role model, showing both strength and vulnerability, intelligence as well as emotions. She’s decidedly not a male hero changed into a female character. On the other hand, she does have to keep a straight face in a sequence where she’s shown cutting her own hair and then appears with a perfectly coiffed shag haircut. Only in the movies. The conspiracy gets more complex not only with the mysterious box that Jeanine hopes to use to wipe out the Divergents for good, but also the discovery of the “factionless” who may be a wild card in the proceedings. As adolescent science fantasy adventure, this should hit the sweet spot for its intended viewers (consumers of YA fiction of whatever age), but as serious science fiction, there’s a lot “handwavium” with technology that makes no sense except that it fulfills the needs of the plot. One such device seems to offer no hope of escape and then, just as easily, is suddenly no longer a factor. Woodley carries the weight of the film, but Winslet seems to enjoy playing a ruthless villain. Naomi Watts shows up in a different sort of role among the factionless. Ashley Judd, playing Tris’s mother, returns even though she was killed in the first film. There’s a lot to be said for simulations and dream sequences.